Companies and organizations carrying out many tasks at different locations and that have many cars and employees who could be assigned to various tasks will often have great potential for savings with route planning and fleet optimization. When an organization considers to implement route planning the objectives should be increased productivity, savings and increased quality in costumer services. 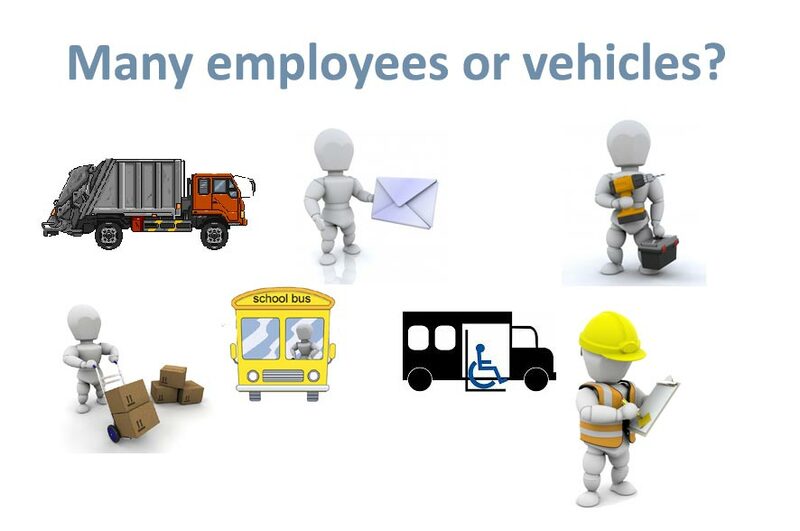 Savings can arise from better utilization of company resources; all the cars and other vehicles you have and the mobile workers like drivers, technicians or service personnel who should carry out tasks at different addresses. When automating route planning, you will probably also experience significant savings on the office time spent planning the routes. As route scheduling programs are refined, many will find that planning for a large fleet of vehicles and employees can be done completely automatically. 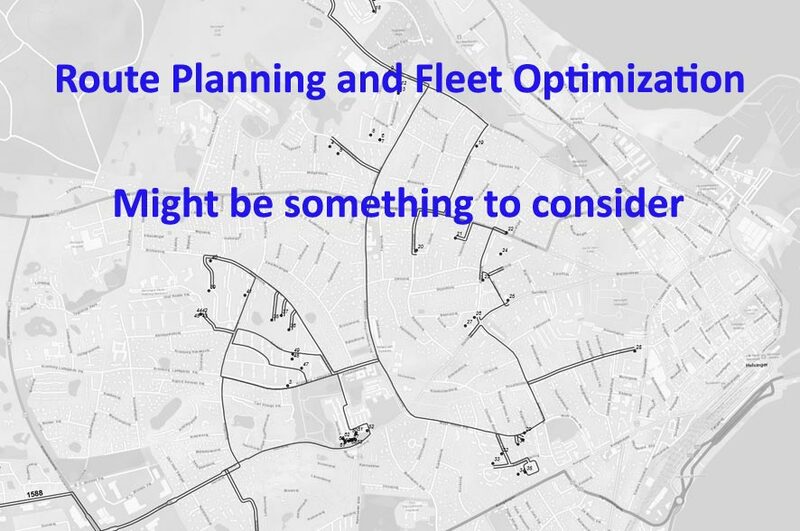 Better quality and increased service levels as a result of automated route planning and fleet optimization derives from better prediction of arrival times, which can be communicated to customers, but also from the fact that the route planning engine can accommodate allthe requirements associated with a task. This could be the need for special employee or vehicle qualifications or time windows where the task is allowed to be solved. Finally organizations find that the speed of the route planning process makes it possible to allow for costumers to order goods or to book services at a later time and still get serviced the following day. The goal is to make “the best overall plan” for a fleet of vehicles and employees. “The best plan” is then defined as the plan that offers both the lowest total costs and, at the same time, meets all requirements and restrictions. software will calculate and then minimize are “total driving time between the tasks and the number of vehicles / employees to be used. Sometimes it is also relevant to include a cost for waiting time if a resource arrives at a task location before the beginning of the allow time window. For school bus routes, medical trips and other demand responsive transport services there will be even more cost elements; primarily to ensure passenger convenience by creating routes that keep individual travel time for all passengers as low as possible. Besides keeping costs low it is also essential that the route planning software ensures that all routes will respect all restrictions and constraints that the company attaches to each tasks. In practice, both the tasks that needs to be solved and the vehicles and employees available to perform the tasks must be described as input to route planning software. 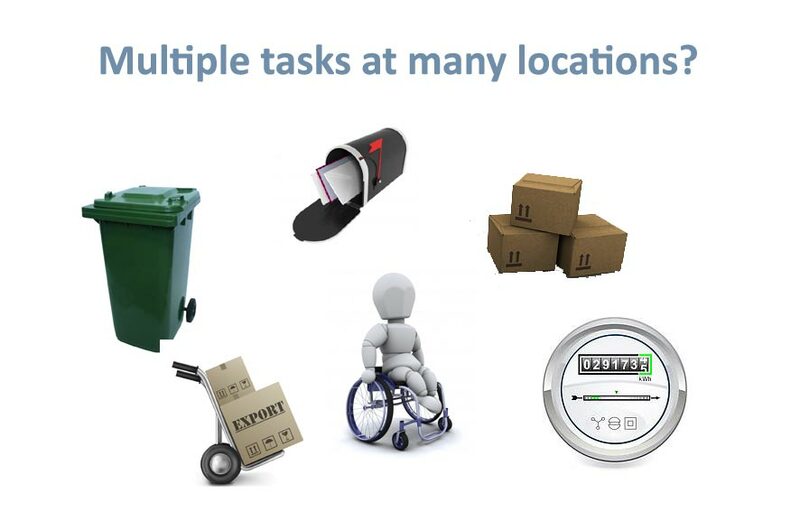 The information needed on tasks includes the addresses where tasks must be performed, the time it takes to complete a task, one or more time windows where the task can be performed, requirements for special qualifications to perform the task, weight and volume of deliveries, preferred driver (resource group) etc. Resources; the vehicles and employees, are described with information about working hours, breaks, locations to start and end the working day, qualifications and memberships of resource groups, etc. restrictions. Costs for each route plan are then calculated and summed up to the total costs of the plan. and it is precisely here that the software for route planning surpasses what is possible for a human planner. When all improvement steps are completed and all cost reductions are utilized; Logistics Planner will delivered route plans for each vehicle and employee. Driving orders can be lists and or routes shown on a map. it can be optimization of a single route or a district for which it has already been decided what tasks are associated with the route (TSP or Traveling Salesman Problem); The planning is then just about optimizing the order or sequence of which the tasks should be performed. Rapidis Logistics Planner offers both types of route planning, VRP and TSP. It is our experience that the fleet optimization (VRP) provides much larger savings and therefore should be preferred if possible. Many companies can benefit from both fleet optimization and single route optimization for different purposes. For example; if you initially fleet optimization and then single-route optimization to add new tasks that occur throughout the day, you have a fairly flexible solution that takes into account that most businesses only know some of today’s tasks when working hours begin. Rapidis Logistics Planner is a Web Service (Geo Processing Service) and can be regarded as a powerful calculator. With the right input data it will produce optimal routes for a fleet of vehicles and employees. Logistics Planner has no graphic user interface – you can communicate with the planner from a booking system, a transport management system or from an ERP system, which holds information about the tasks and the available resources. However, using RLP it is very easy to add resultmaps and more advanced GUI that includes map by using ESRI services. Rapidis work closely with our partners who offer solutions in combination with Rapidis Logistics Planner targeted at different industries and needs. The planner can also be used i combination with ArcGIS for server or desktop. Logistics Planner for ArcGIS is an extension, that works as an integrated part of ArcGIS and ads options to solve more and other logistic problems than the standard ArcGIS – everything within the areas of scheduling, fleet optimization and route planning. Logistics Planner for ArcGIS is available with tools for pick-up-and-delivery (PD) for Demand Responsive Transport, tools for Vehicle Routing Problem (VRP) for planning of goods distribution and service technicians and finally with tools for Dense Routing or High Density Routing. The Core of Rapidis Logistics Planner for ArcGIS is two geoprocessing tools (GP tools) which are compatible with Network Analyst and at the same time add new planning functionalities. Rapidis solve multiple scenarios within route planning, scheduling and logistics with our software “Rapidis Logistics Planner” (RLP) which is a fast software component for fleet optimization and analytics. RLP works perfect as extension for ArcGIS, but all RLP editions are also available as cloud hosted web services. Please contact Leif Dahl Petersen for more information, pricing and documentation.